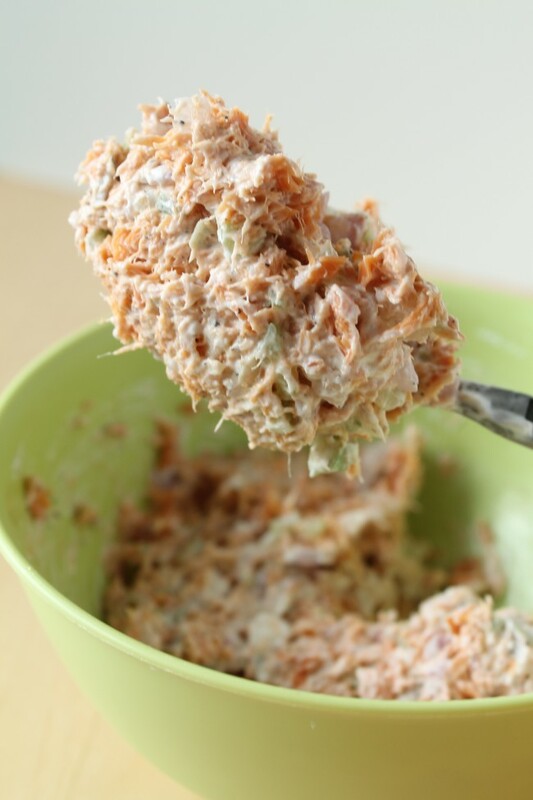 This easy smoked salmon dip makes a simple but elegant appetizer! 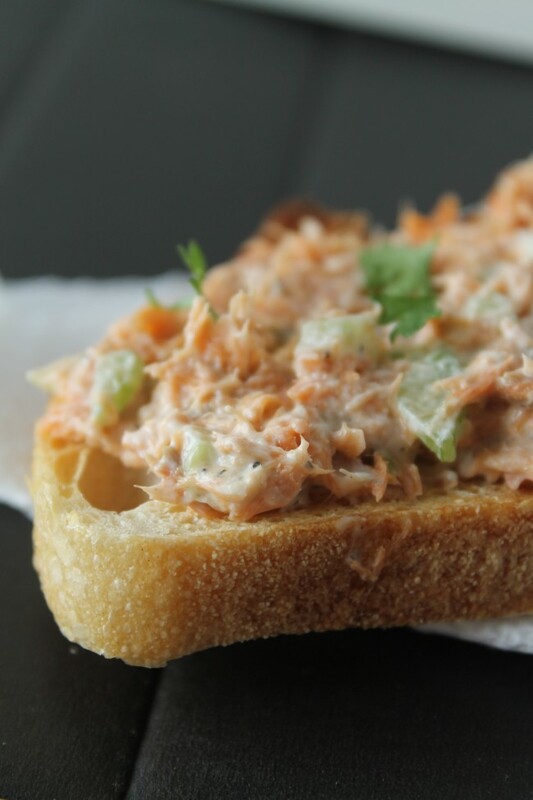 Serve it as a salmon spread on toast or inside refreshing cucumber cups. Smoked salmon will always have a place in my heart. Maybe it’s the nostalgia: my west coast, seafood-lovin’ roots calling out to me way out here in the middle of the midwest. Maybe it’s the same type of nostalgic love that will keep every N’SYNC album on my iPod until the end of time, or the kind of love that drives me to watch The Swan Princess in my pjs instead of doing anything real with my life. Or Anastasia. Or Beauty and the Beast. Or The Little Mermaid. Or all of them back to back. Whatever. Bottom line: I could put smoked salmon in pretty much everything I make for the rest of forever. This is a slightly adapted version of one of my mom’s classic appetizer recipes. 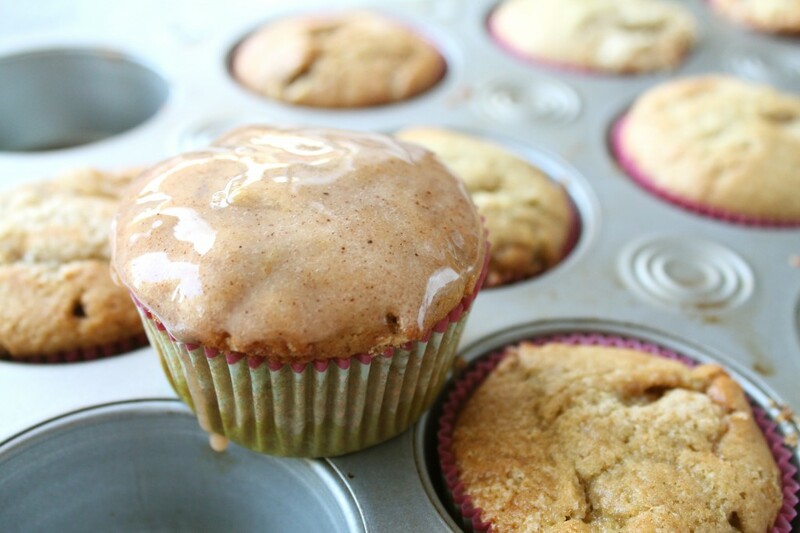 It’s super simple and OH-so-delicious, with the perfect amount of crunch. 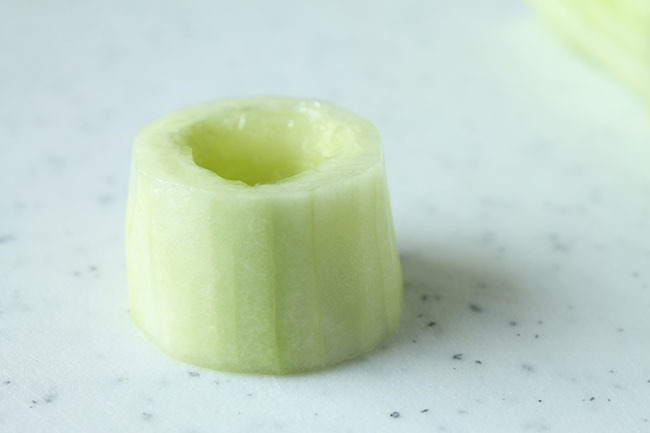 I’m going to show you how to stuff it in little cucumber cups for party appetizers, although I often just throw it together and slather it on some toast for lunch. Both methods are pretty darn delicious. And then slice it up in 1-2 inch slices. 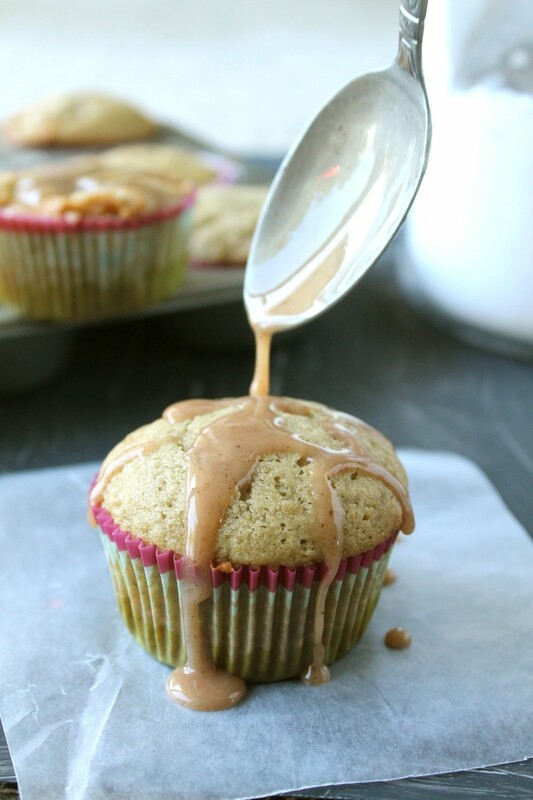 Use a spoon or a melon baller to scoop out the innards of each slice, being careful not to pierce through the bottom. Spoon a bit of dip into each cucumber cup and top them with a bit of parsley. Then take any extra dip and make yourself some smoked salmon toast. You deserve it. 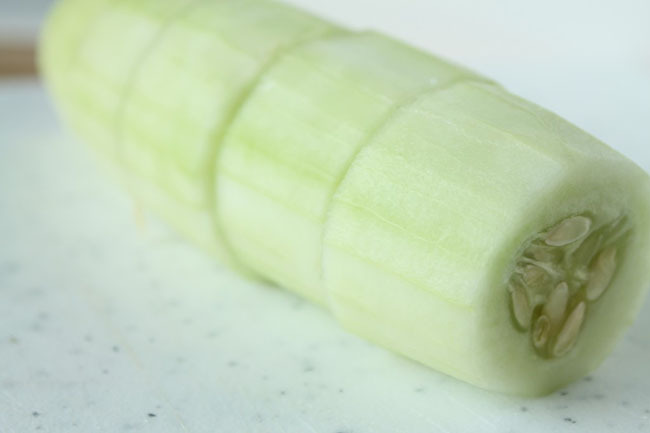 This is a great make-ahead dip – you can store it on its own in the fridge for a few days before you even cut the cucumber cups. 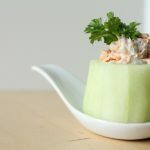 If the cups are too cucumber-y for you, it works well atop plain ol’ slices of cucumber as well. Not a cucumber fan at all? Serve the dip with toast points, bagel chips, pita chips, or crostini. Gently separate smoked salmon into small chunks with your hands. Place in medium-sized bowl. 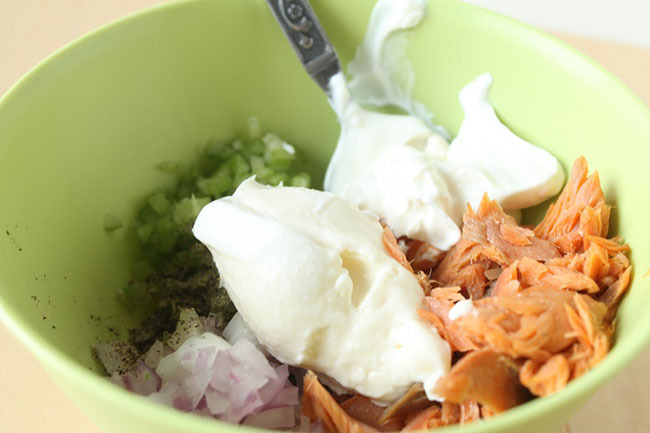 Add remaining ingredients to salmon and stir gently until just combined. 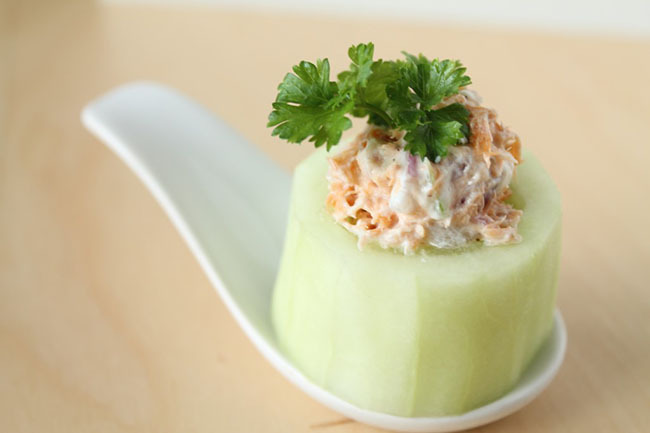 Spoon mixture into cucumber cups and top with a fresh sprig of parsley. Serve cold. 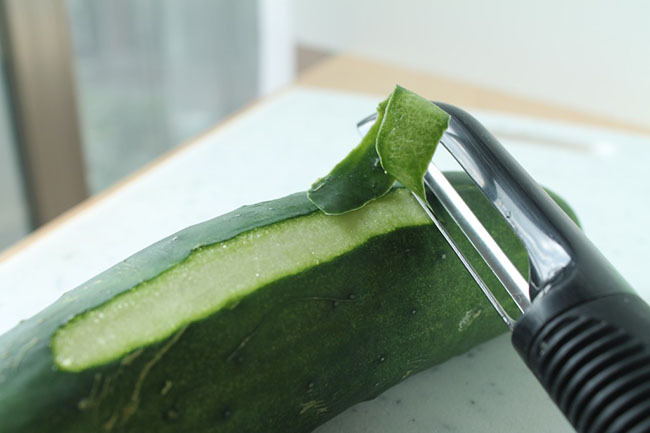 Peel cucumber and slice into 1-2 inch pieces. Use a melon baller or a spoon to scrape the seeds out of each slice, taking care not to pierce through the bottom of the cup. 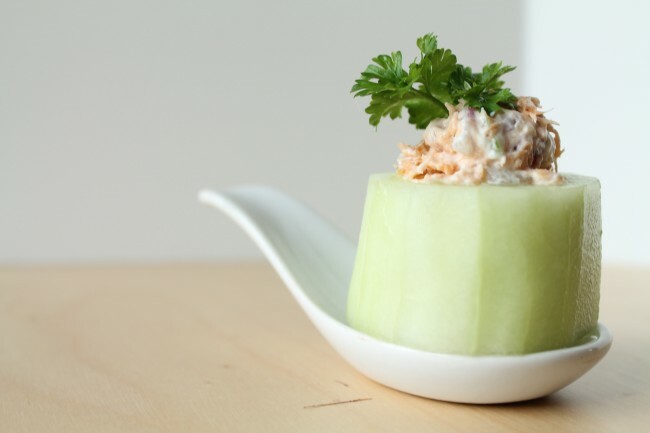 The sides of the cucumber cup can be relatively thin to allow a larger amount of smoked salmon dip. 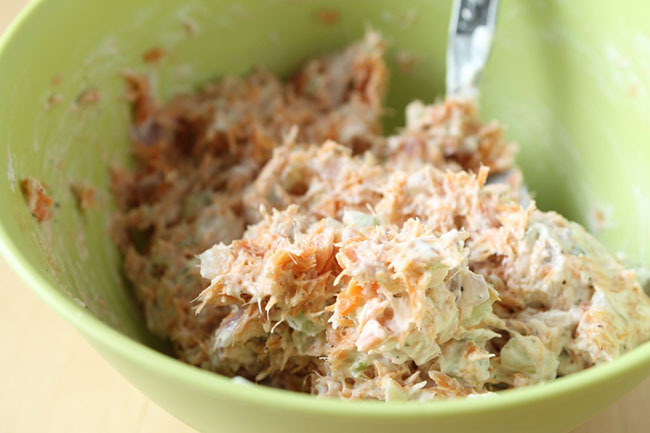 Place cups in the fridge until ready for use or immediately fill with salmon dip. Top with a fresh sprig of parsley. Serve cold. Use plain Greek Yogurt in place of the sour cream for a lighter option. 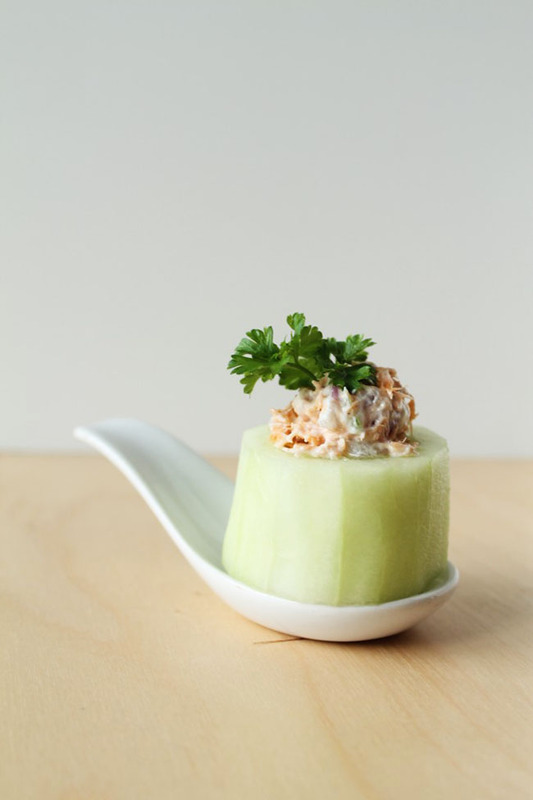 You could also serve this dip on toast or atop thick cucumber slices instead of the cucumber cups. Two easy, elegant ways to use fresh strawberries: as homemade chocolate dipped tuxedo strawberries AND as a simple strawberry crostini with balsamic strawberries! It starts with a strawberry. 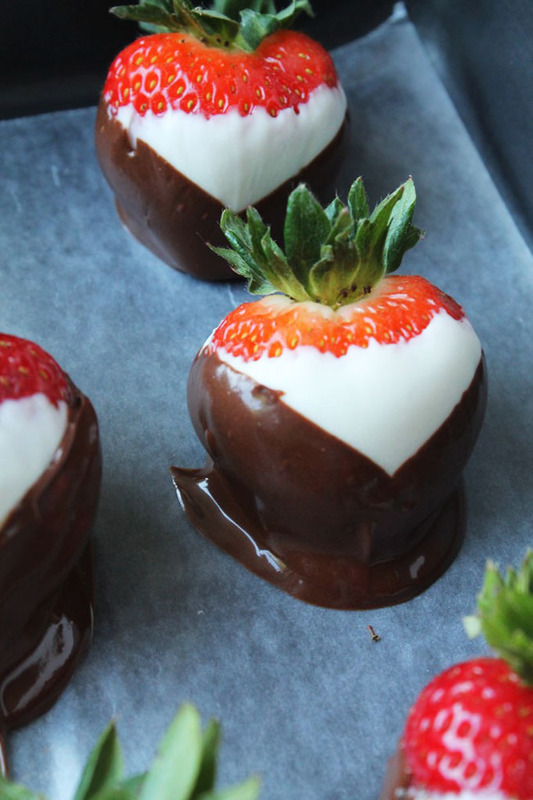 And then one day, you decide to dip those strawberries in chocolate and with them throw yourself headfirst into the blogosphere because hey, why not? (At least, that’s what I did). 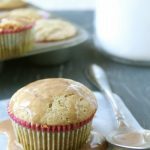 In celebration, I’m giving you TWO WHOLE RECIPES that give you a reason to buy the bucket of strawberries that’s been calling your name at the grocery store. (If they haven’t been calling your name, go get some anyway. It’s worth it, I promise). Welcome to post number one. Let’s start with dessert! 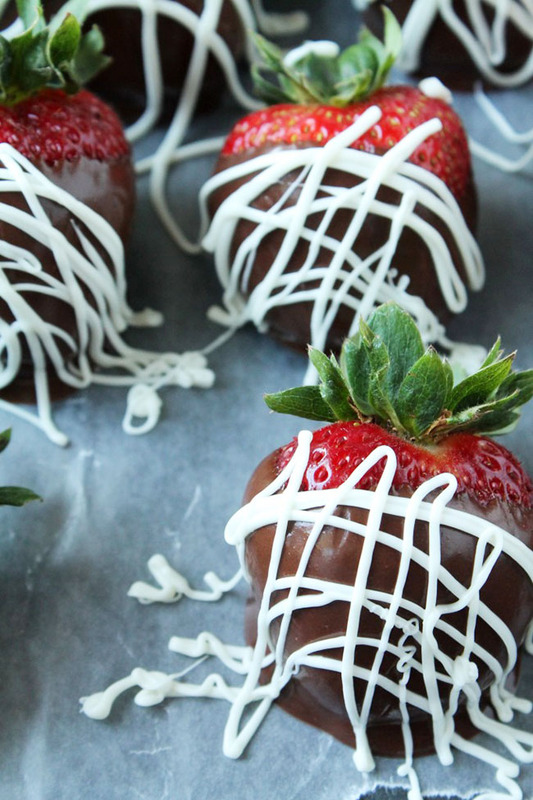 Chocolate covered strawberries are pretty much the best things ever. And today, they get all dressed up to help me celebrate my first blog post. 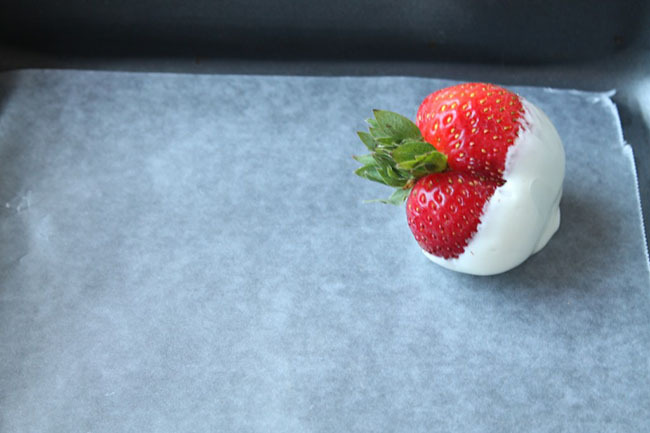 Start by dipping a strawberry in white chocolate, and then give it a few friends. 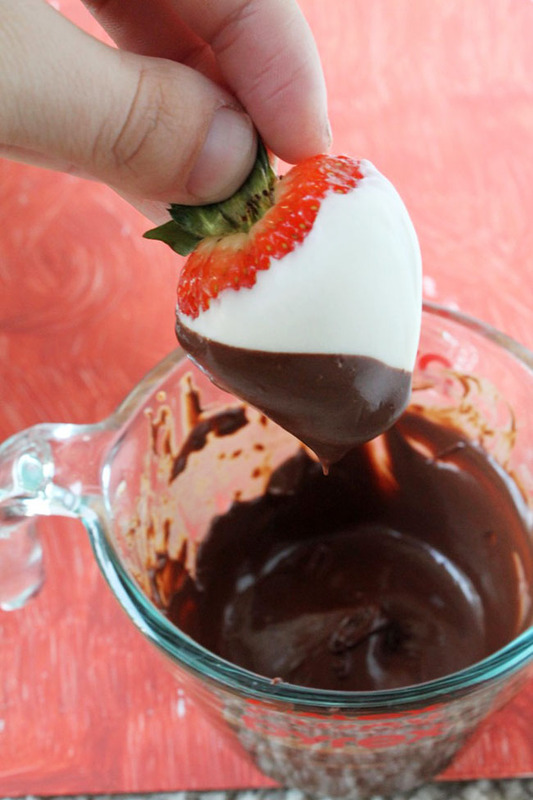 Then dip some berries in semi-sweet chocolate, too. Because you can. Go call your mom. Clean your kitchen. Organize your closet. Whatever. But let your berries set up a bit so that when you dip them again they’ll be solid, not melty. If you’re having the same blazing, terrible heat as we are, you can pop them in the fridge for twenty minutes or so. That usually does the trick. …and then do the same to the other side. 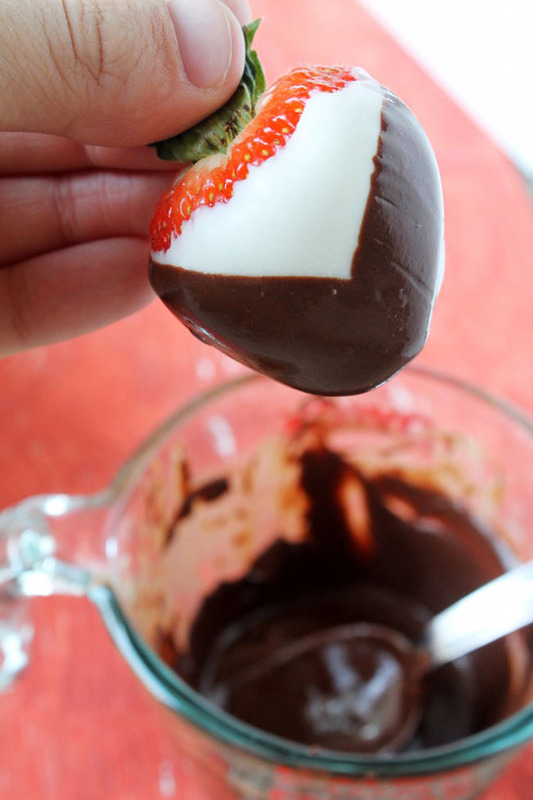 Take your extra white and semi-sweet chocolate and put each in a separate small plastic bag. Cut the teensiest-tiniest hole you can manage in the corner so you can pipe some decorations on your berries. If you accidentally cut too big of a hole, or if you’d rather not use a bag, a toothpick dipped in the chocolate will work just as well, although it will go a bit slower. 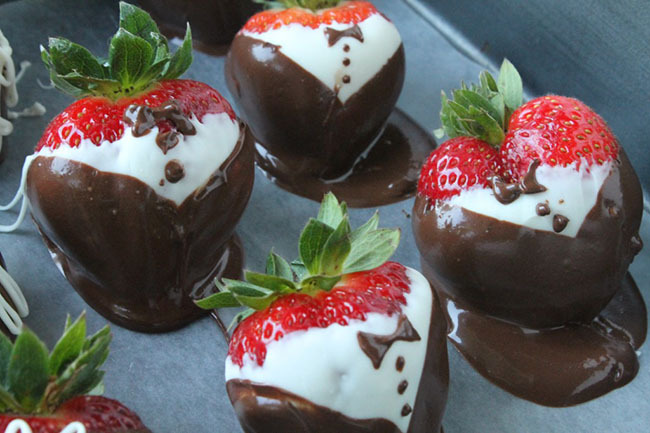 Pipe some buttons on your berries’ tuxes. And then give ’em little bowties. 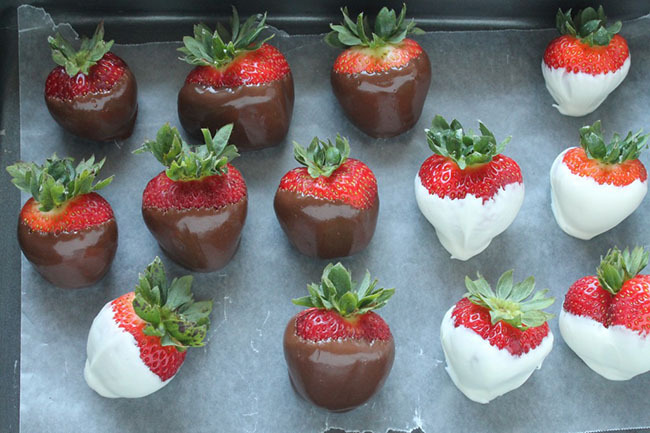 Now drizzle the extra white chocolate over your semi-sweet strawberries. While you’re fighting the temptation to eat all of your berries RIGHT THIS VERY MOMENT, slice up some new strawberries and let them marinate in a bowl with a bit of balsamic vinegar. 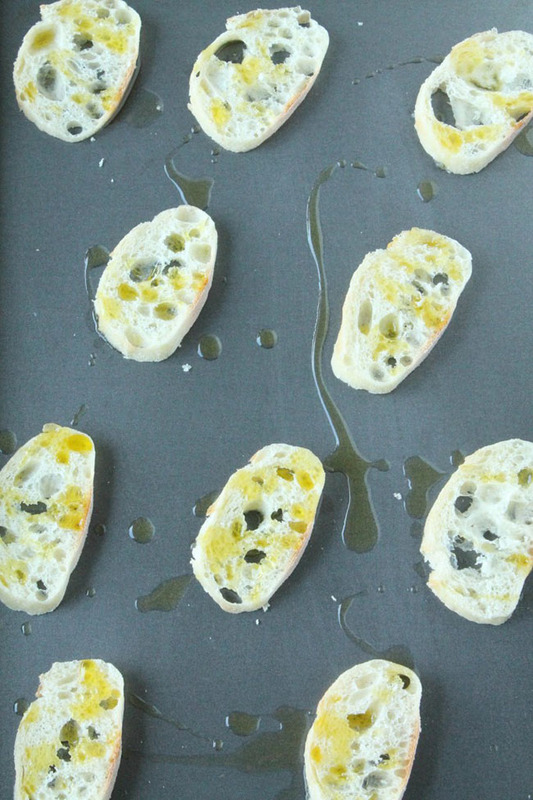 While those are delicious-ifying themselves, toast some baguette slices in the broiler with a drizzle of olive oil. When the toast is toasted, let it cool for a few minutes while you make your cheese and herb mixture. 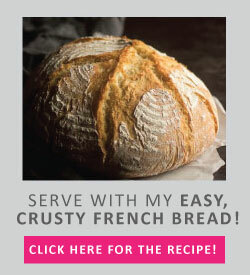 Then spoon that onto your baguette slices. Top with a few slices of balsamic strawberries. Take a bite. Do a happy dance. 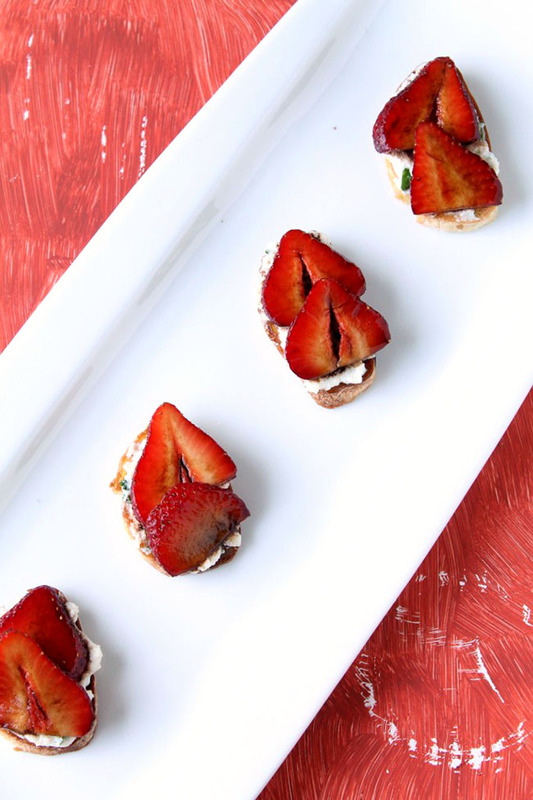 Eat almost all of the strawberry crostini before you remember you still have tuxedo strawberries sitting on your counter. Worry that you’re ruining your dinner. 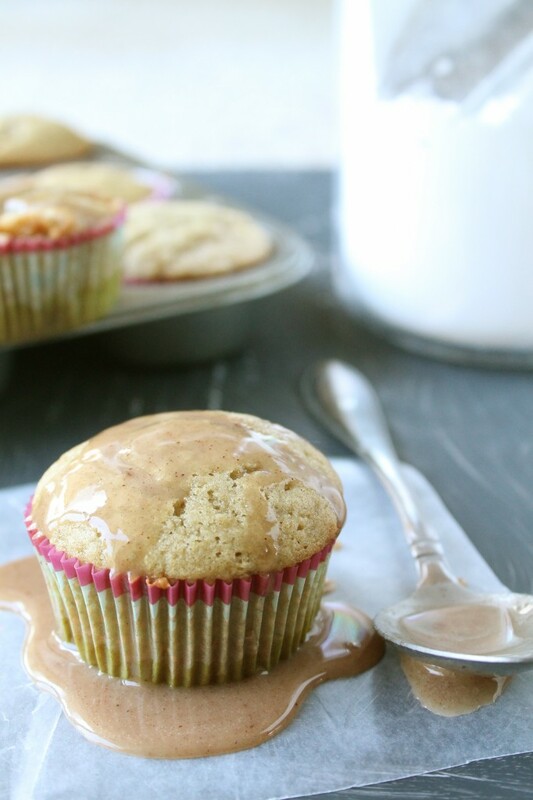 Get over that crazy thinking pretty quickly and take another bite. 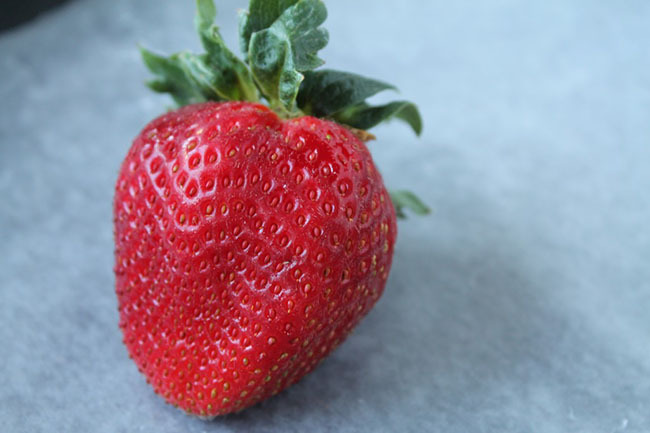 If you’re not a strawberries-covered-in-balsamic-vinegar fan, you could easily mix a bit of the vinegar into the cheese mixture to retain the tangy-ness and put regular ol’ sliced strawberries on top. This cheese mix is also stellar all by itself on top of any kind of toast. 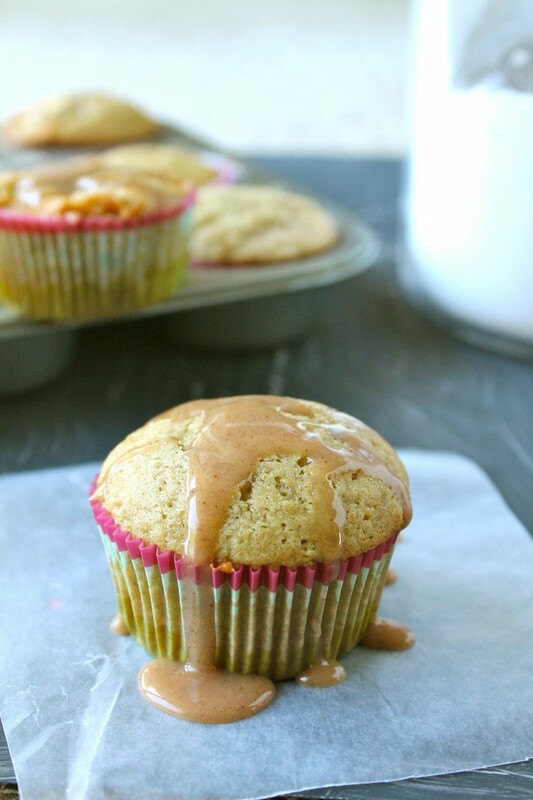 Substitute tomatoes or chick peas for the strawberries if you want to mix it up a little. Thanks for reading, friends. Stay tuned for more from my kitchen! 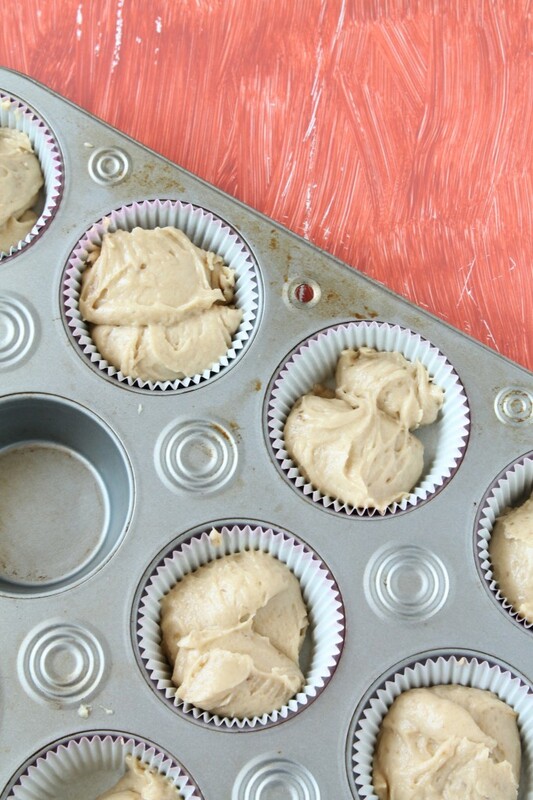 Melt the white chocolate with 2 tsp. 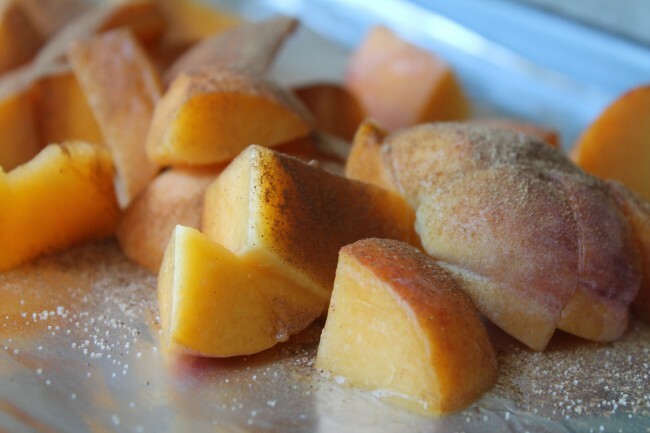 of the shortening in a double broiler or in the microwave. If you microwave, heat the chocolate in 45 second increments and stir in between each cycle. 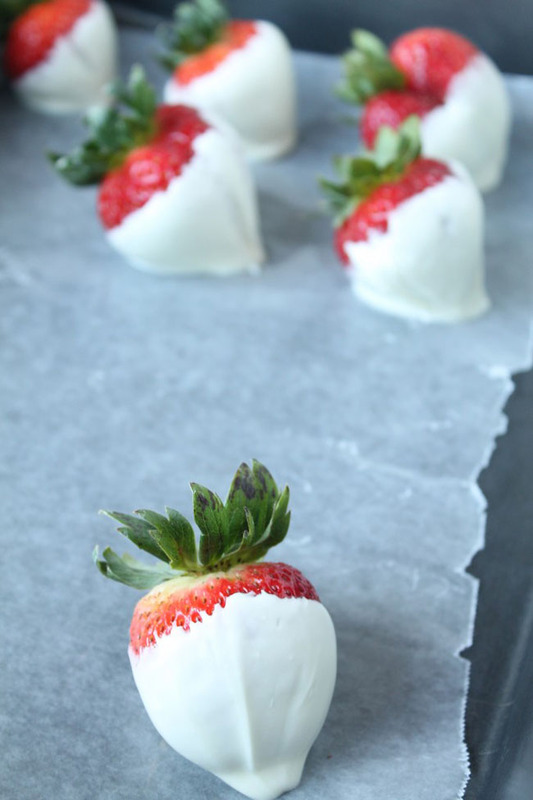 Dip 7 or 8 berries in the white chocolate and set them on a sheet of wax paper to cool. 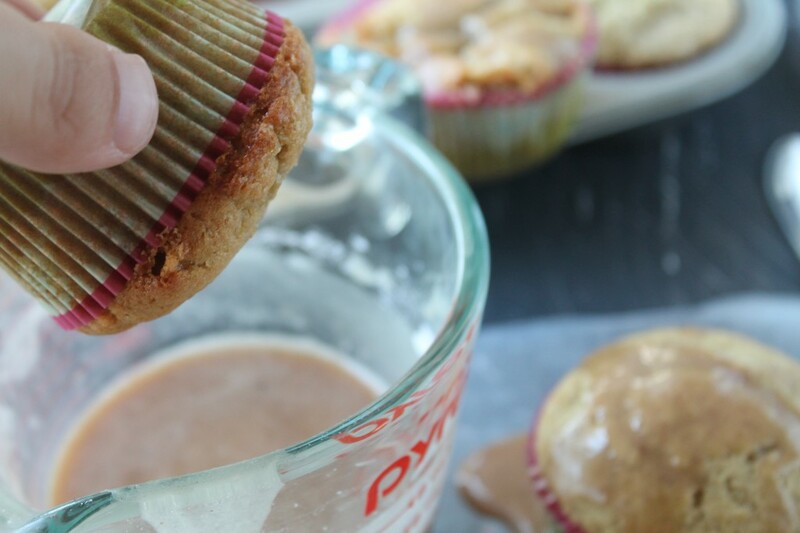 Melt the semi-sweet chocolate with the remaining 2 tsp. of shortening. 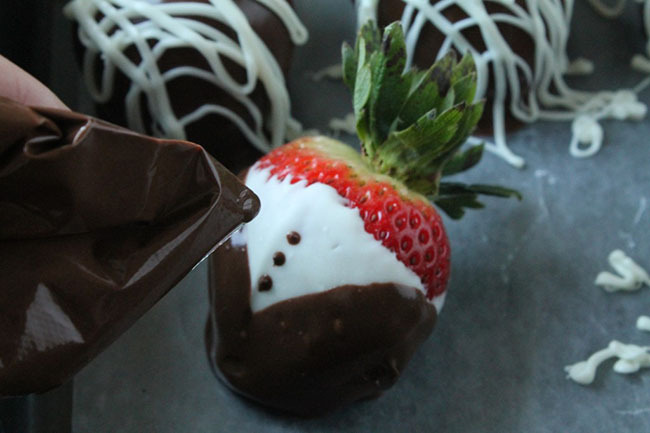 Let the dipped strawberries set for at least fifteen minutes. Dip one side of the white chocolate strawberries in the semi-sweet chocolate at a steep angle. Repeat with the other side to form a “V” on the front of the berry. Put remaining white and semi-sweet chocolate in separate ziploc bags and cut a small hole in the corner of each. 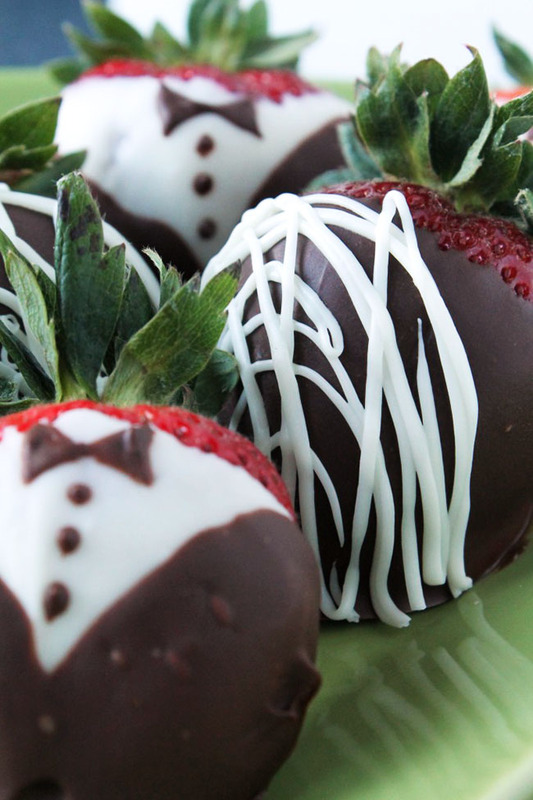 Use the semi-sweet chocolate to pipe buttons and bowties onto the tuxedo strawberries. If the bag is piping too much chocolate, dip a toothpick in the chocolate instead and use it to “draw” the details on. 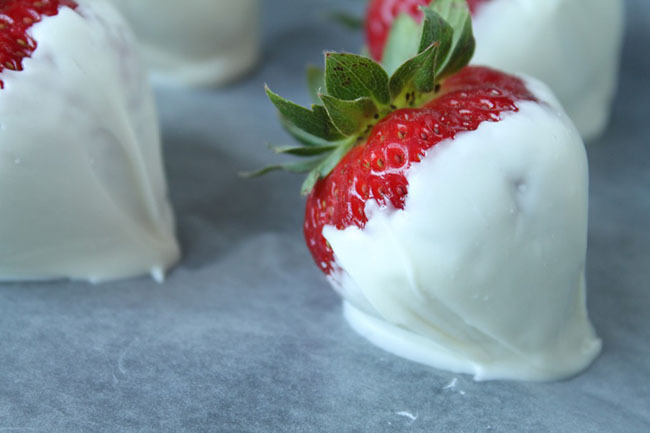 Drizzle remaining white chocolate over semi-sweet covered strawberries in a side-to-side motion. 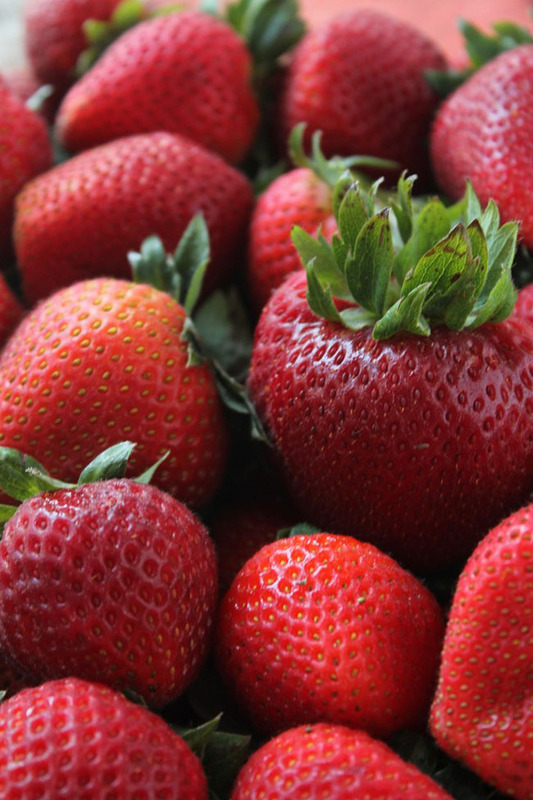 Let berries set on the counter or in the fridge for 30 minutes to an hour. 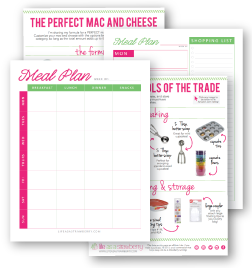 Serve cold or at room temperature. 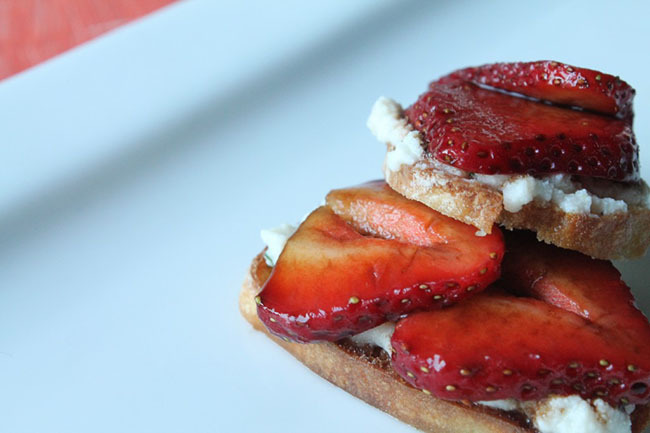 Thinly slice the strawberries and mix them with the balsamic vinegar. Set aside. Place 10 baguette slices on a sheet pan and drizzle with olive oil. Broil on high for 1-2 minutes or until lightly toasted. Let cool. In a small bowl, mix the ricotta, honey, lemon juice, parmesan cheese, basil, parsley, salt, and pepper. Spread about 1 teaspoon of the cheese mixture onto each baguette slice. 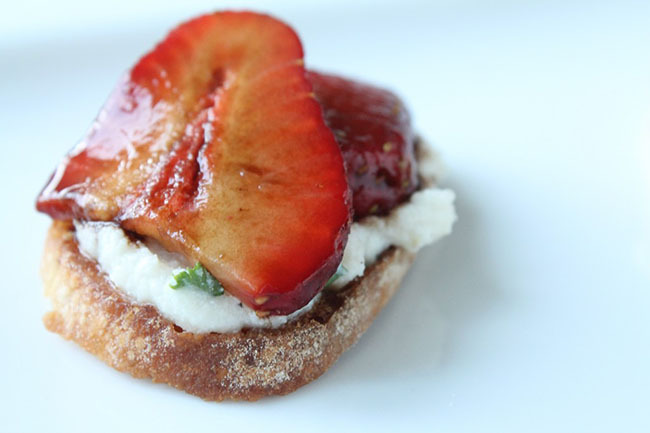 Top with 2-3 slices of balsamic-marinated strawberries. Serve immediately.